In order to make second and third generation biofuels a reality, a lot of research still has to be done. This is precisely why the US Department of Energy and European partners have teamed up to form the Joint Genome Institute which will be researching how to engineer energy crops and micro-organisms. Key to the research is genetic sequencing of 40 different high potential organisms: the genomes of these plants and microbes will be sequenced and characterized as part of a Community Sequencing Program (CSP). More than 15 billion letters of genetic code -- the equivalent of the human genome five times over -- will be processed through the DNA sequencers at the DOE JGI Production Genomics Facility. A major part of the project is the sequencing the of cassava genome (Manihot esculenta). 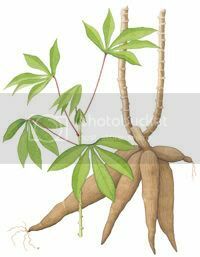 Cassava (about which we reported earlier here, here, here and here) is a so-called 'underresearched' crop, even though it makes for an excellent energy source and is a staple food for approximately one billion people around the planet. Its roots contain 20 to 40% starch from which ethanol can be derived, making it an attractive and strategic source of renewable energy. Moreover, the crop yields a vast amount of woody and ligno-cellulosic biomass from the shrub, that is not being used today. And this mass makes a future feedstock for second and third generation biofuels. Cassava is a crop with great potential because it grows in diverse environments, from extremely dry to humid climates, acidic to alkaline soils, from sea level to high altitudes, and in nutrient-poor soil. It also dislikes rainforest ecologies - which is important given the debate over tropical energy crops' potential to damage the environment and in particular rainforests (e.g. palm oil). Improved genetically altered cassava yielding up to 2.6 times more than ordinary plants already exists (see earlier post), but there's much more to learn still. Sequencing the cassava genome will help bring this important crop to the forefront of modern science and generate new possibilities for agronomic and nutritional improvement. It is a most welcome development. The cassava project will extend benefits to its vast research community, including a better understanding of starch and protein biosynthesis, root storage, and stress controls, and enable crop improvements, while shedding light on such mechanisms shared by other important related plants, including the rubber tree and castor bean. The cassava project, led by Claude M. Fauquet, Director of the International Laboratory for Tropical Agricultural Biotechnology and colleagues at the Danforth Plant Science Center in St. Louis, includes contributions from the USDA laboratory in Fargo, ND; Washington University St Louis; University of Chicago; The Institute for Genomic Research (TIGR); Missouri Botanical Garden; the Broad Institute; Ohio State University; the International Center for Tropical Agriculture (CIAT) in Cali, Colombia; and the Smithsonian Institution. This research is important to the Biopact's objective of supporting Africa's development of a viable biofuels industry. Currently, more than 300 million people in sub-Saharan Africa plant, harvest and use cassava on a daily basis for food, feed, fibre and energy. With a much improved crop that is easy to handle, these farmers can become the energy farmers of the future. They have the land, the climate and the human resources to do so. And soon they will have a very competitive energy crop to plant on that land. A full list of the CSP 2007 sequencing projects can be found here. [Entry ends here].